Can Milwaukee Upgrade to Gold Ranking? City officials pledge to work towards upgrading the city's national, bicycle-friendly ranking from bronze to gold. 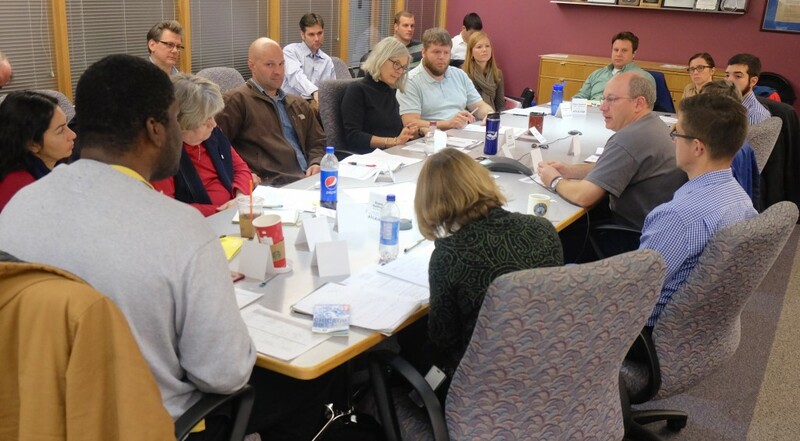 On Friday December 5th, the City of Milwaukee Bicycle and Pedestrian Task Force met. This is a pretty long post about that meeting, but there is lots to report. And I have saved some of the most exciting news for last! 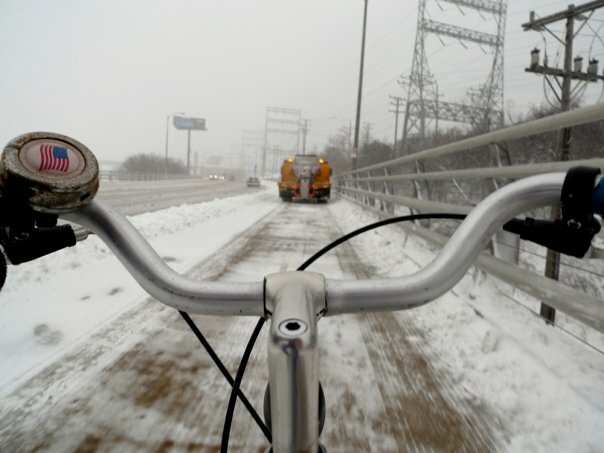 At that Task Force meeting, City Engineer Jeff Polenske announced the disappointing news that the League of American Bicyclists once again only rated Milwaukee a Bronze level Bicycle Friendly Community in the most recent rankings. While Bronze is still on the podium, Milwaukee has been stuck with a Bronze ranking longer than the Bronze Fonz has been hanging around the Riverwalk. The City of Milwaukee Bicycle and Pedestrian Task Force meets the first Fridays from 9am to 11am on the even months of the year. Given all the improvements that have been made in Milwaukee since the last application, the staff at the Bike Fed and the city thought Milwaukee was a shoe-in for a silver ranking this time. The only other silver-rated city in Wisconsin is La Crosse (Madison is Gold), and Milwaukee has far more bicycle facilities and now a functioning Bublr Bike Share Program. Unfortunately, it appears the LAB has moved the goal posts since La Crosse applied, and now has much higher standards. Click image to open a PDF of this report card. That League does provide a very good report card that lists how we scored and where we can improve if we want to get to Silver. I am happy to report that the city has agreed to a recommendation the Bike Fed made a year ago to Mayor Tom Barrett. Polenske announced that Milwaukee will form a Gold Committee in 2014, in the hopes of bunny hopping right over Silver status. Dave Cieslewicz and I suggested Milwaukee form a Gold Committee in a meeting with Mayor Barrett, his staff and senior DPW staff last year. Cieslewicz mentioned that Madison has a Platinum Biking Committee and it has been an excellent way to engage the local business community as well as the cycling community. Everyone at the Task Force agreed, that once Bublr bikes expands, the city finishes installing the bike lanes they have planned, and you take into account the increase in bicycle mode share ( 1.14 percent in 2013, up from .79 percent in 2012), we should make silver just by submitting an application, which we can do at any time. The City of Milwaukee once again was awarded a Bronze Bicycle Friendly Community award status by the League of American Bicyclists. We know the bar is continually being raised on what it means to be bicycle-friendly. To meet those challenges, City of Milwaukee Mayor Tom Barrett has directed Milwaukee’s Department of Public Works Commissioner Ghassan Korban and City Engineer Jeff Polenske to establish a sub-committee of the City’s Bicycle and Pedestrian Task Force to define the path to not only reaching Silver but going for Gold-level status. Increase bicycle parking: Milwaukee was just awarded a $500,000+ Transportation Alternatives Program (TAP) grant to develop a business-friendly cost-share bicycle parking program, which will streamline installation of high quality bicycle parking. The City has also begun allocating annual funding to replace aging bicycle racks and is drafting new bicycle parking code requirements. Rapidly expand bike sharing: City staff is currently developing 30 – 40 bike share station sites, which will be rolled out in 2015 and 2016 using a $1.6 million CMAQ grant. Install a bicycle way-finding system: The City and Milwaukee County Parks are regularly collaborating on projects and programs, including developing a joint trail/bicycling facilities signage plan in 2015. Together, the City and County have also been installing automated trail traffic counters, and have partnered with an urban planning professor from the University of Wisconsin-Milwaukee to crunch the data for us. Expand SRTS program: The Wisconsin Bike Fed (Milwaukee office), in partnership with Milwaukee Public Schools, is extending its successful Safe Routes to School (SRTS) on-the-bike curriculum to more schools over the next three years as new grant funds roll in for this innovative program. The City will also be developing an SRTS policy plan plus 15 school-specific SRTS plans starting in 2016. Adopt a Complete Streets policy: The City is developing a Complete Streets policy, and in 2015 will be examining its internal project development and delivery procedures to ensure more positive results from the many projects the City develops and completes every year. Upgrading and refilling its Bicycle and Pedestrian Coordinator position in early 2013 (now held by Kristin Bennett). Milwaukee is really seeing the fruits of its efforts. Recently released American Community Survey (ACS) data show that bicycle commuting has increased from 0.47% in 2006 when Milwaukee was first awarded Bronze BFC status, to 1.14% in 2013, a nearly 60% increase. During this discussion at the Task Force meeting, I offered to have the Bike Fed lead the Gold Committee if that were helpful. I suggested we could recommend a group of motivated business and community leaders. Of course the committee would include members of the Bike/Ped Task Force and key people from the Department of Public Works and Department of City Development, but it might also include representation from the Common Council and someone from Mayor Barrett’s staff. Once appointed, we would meet bi-monthly on the opposite months that the Task Force meets. I will update you all on that, but my suggestion was to have the first planning meeting on January 16th, the second Friday of every odd month, opposite the Task Force meetings. I also suggested the Bike Fed would share all this information at our evening monthly meetings in Milwaukee, which occur on the third Tuesday of each month. That is a lot of meetings, but we need to keep all the momentum we have built and give as many people the ability to participate as possible. Stay tuned for an announcement about the Gold Committee soon. The path to gold will require the city to make big gains in ridership. That will require better facilities. Bennett provided a comprehensive update on bicycle projects the City of Milwaukee has in process. I have boiled down her list below, and provided some additional commentary of my own. 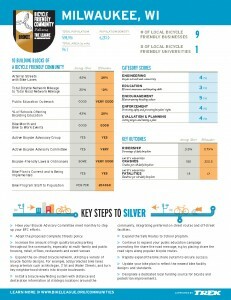 I think it is good for Bike Fed members to see how many projects there are underway just in the City of Milwaukee. Remember the Oak Leaf is a Milwaukee County trail, so issues with that are outside City DPW jurisdiction, even though much of the trail falls within city borders. While the city’s Dept. of Public Works has many excellent engineers who are assigned to manage those bicycle projects that involve construction, they all begin with the Bicycle Coordinator. I can tell you from personal experience, the bureaucratic process and paperwork required to implement a project that uses federal or state funds is staggering. It can easily take a year just to complete the process needed to get WisDOT approval to advertise a project. Remember the LAB scores the city on how many staff they have in the bicycle program. Milwaukee only has one person, while most Silver and Gold BFCs have several. Adding staff would also help move projects along faster. This update is compiled by the City Bicycle/Pedestrian Transportation Coordinator, based on input from numerous city staff. If you have questions or would like updates on other projects/programs, contactbicycling@milwaukee.gov or (414) 286-8750. Changes from the previous report are noted in italic text. The City’s design consultant team has completed environmental documentation and final trail design/ alignments. The right-of-way acquisition process is fully underway. The city issued a Request for Bids for construction before November 2014 when the project’s federal grant funding would have been rescinded per the recently approved Wisconsin Act 20, which shortened the timeline to complete certain kinds of projects. Construction is slated for Spring/Summer 2015. The Greater Milwaukee Committee and Beintween recieved a $724,500 grant to help add public art to this trail, which already has significant momentum thanks to Keith Hayes of Beintween and the Artery. This has the potential to be another signature trail in Milwaukee that gains national attention, like the Marsupial Bridge and Hank Aaron State Trail. City crews painted bicycle legends/arrows for some of the 24 miles of bike lanes striped last summer/fall. The project budget is roughly 50 percent spent. Bennett is reviewing what was originally planned and making changes to that list. She will submit a project modification to WisDOT for its review/approval. Additional installations will proceed after modification is approved. The City and County are working on a new map for the City of Milwaukee and hope to have it printed by April in time for the Wheel and Sprocket Bike Expo. Last year the project was delayed due to Bennett’s work injury and time out of the office. There are no bicycle maps available at this time. The City has purchase approximately 165 new bicycle racks to be installed on High Impact Paving Program streets as well as starting to replace damaged/heavily rusted existing bike racks in the public ROW. Specific installation locations to be determined. 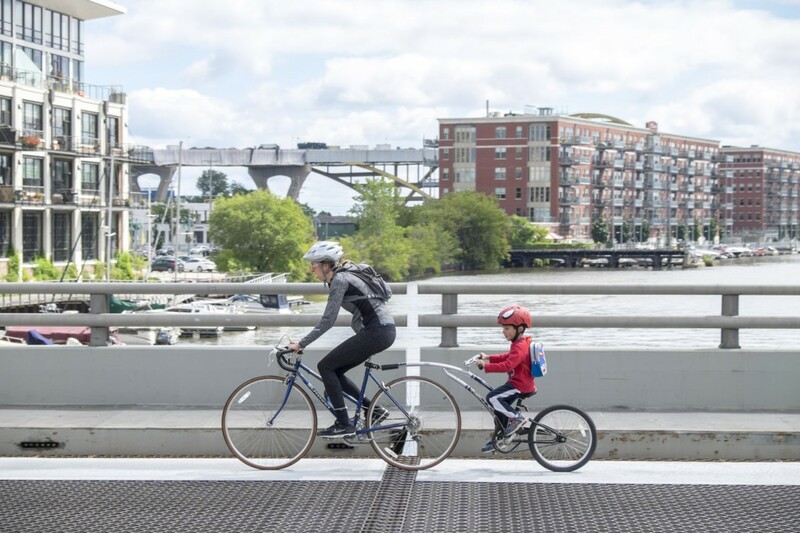 The City was awarded $547,016 in federal Transportation Alternatives Program (TAP) funds to develop and implement a cost-sharing bicycle-parking program. Funds will not be available for use until sometime in 2015; the city is awaiting a firmer schedule from WisDOT. Department of City Development staff is leading the development of a revised bicycle parking code with DPW staff’s input. Staff has completed research and draft code language for staff and stakeholder review. A DPW intern is developing revised bicycle locker leasing/use policies, assessing the current locker locations, and how to re-market these to obtain new leaseholders. The Bike Sharing System’s 10 stations installed by Midwest Bike Share have been shut down as of December 1st for the winter. Per recent reports shared with city staff, over 5,000 rides were taken using the bicycles since mid-August 2014. Staff is working on the various required screenings and documents (environmental, historic, tribal, etc.) and are actively identifying up to 40 station sites for the aforementioned screening requirements. Staff has also drafted the Request for Proposals to acquire bike sharing equipment/system management software and is just finalizing the document and obtaining state approval to issue it by the end of 2014. The city is targeting installation of these stations in Summer 2015 and also 2016 if the proposed project schedule stays on track. Staff has drafted grant applications for additional funding (decisions pending), and is also reaching out to the cities of Wauwatosa and West Allis and the Village of Shorewood, which all recently were awarded some grant funds to purchase and install stations in their communities. Milwaukee staff has a significant amount of experience that can be shared with peers in these communities. All four communities will be meeting in the near future to share information and discuss common needs and collaboration opportunities. Design work has been completed for bridge plating (and associated counter weights) for Cherry Street, Wells Street, and Water Street bridges; construction timeline to be determined following various WisDOT approvals. The city was awarded $412,692 in federal TAP funding to design and construct solid skid-resistant plating on the N. Plankinton St. (S. 2nd St.) and N. Emmber Lane bridges. NO CHANGE FROM JUNE 2014 REPORT – City staff has had several internal meetings and also a conference call with Smart Growth America’s Complete Streets Program staff for guidance on policy development and public involvement steps. The City Engineer has directed staff to focus on the policy development activities over Summer/Fall 2014. For more detailed information, please review the April 2014 meeting minutes. NO CHANGE FROM APRIL 2014 REPORT – The City was awarded federal safety grant funding to retrofit signalized intersections with pedestrian countdown heads. The awarded funds should be enough to finish retrofitting all remaining pedestrian signal heads citywide by the end of 2015. (Note: not all traffic signals inside the city limits are city-owned/operated, so there may be signals operated by WisDOT or Milwaukee County not retrofitted by that date). Downtown to Bay View Connector – Phase 2 Project (Bay Street – Russell to Conklin / S. Water St. – Washington to Broadway) – NO CHANGE SINCE OCTOBER 2014 REPORT. Construction, which began following Summerfest, was mostly completed as of the October 2014 Task Force meeting. Signage needs to be added along the route outside the grant project. KK River Trail (S. 6th to Lincoln/Washington to Maple) – The proposed mid-block crossing across W. Rosedale Avenue (to provide better access to/from the trail near the UMOS facility) will be constructed in Spring 2015 due to high bids this fall. Staff has completed gap studies for the Maple/S. Kinnickinnic intersection, which has generated user complaints (difficult to cross). The city also needs to add utilitarian way-finding signage. Smart Trips Project (CMAQ-grant funded project) – Wisconsin Bike Fed hired a new project manager, who started in late November. The city and Bike Fed are partnering on this Travel Demand Management (TDM) project. The target neighborhoods for this pilot project are Riverwest and Harambee. We introduced you all to our newest staff member, Tony Giron, in an earlier blog post about the Smart Trips program. DPW bridge maintenance crews already have to clear snow on the Hank Aaron State Trail bridges at 6th and 32nd streets and the Menomonee Vally Passage, as those bridges are city owned. Winter Trail Maintenance, Saving the Best for Last! 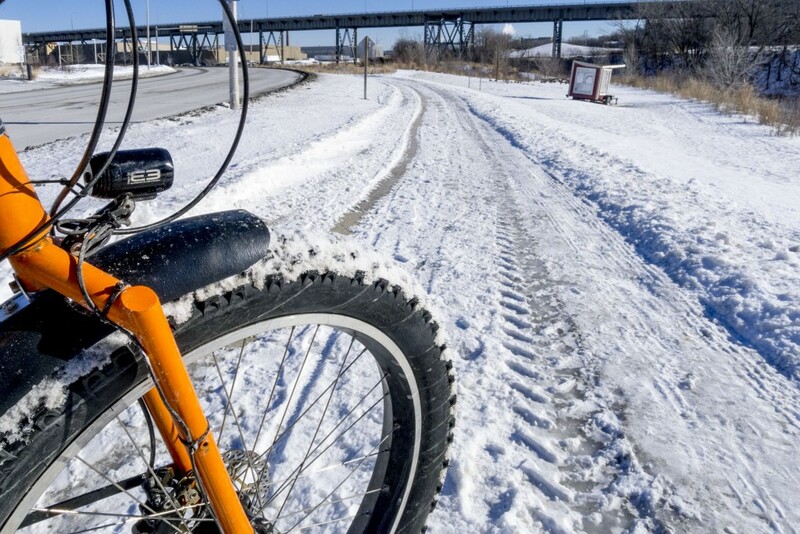 The Bike Fed is very excited to announce that for the first time ever, the city has contracted with a local maintenance company to remove snow/ice on the city-owned trails starting December 1, 2014. This includes the Beerline Trail and KK River Trails. According to DPW spokewoman Sandra Rusch Walton, the city has a contract for snow clearing on the Beerline Trail and the KK River Trail that requires these trails are to be cleared within 48 hours after snow stops falling. The city staff has been reaching out to Milwaukee County Parks (Oak Leaf Trail) and Department of Natural Resources (Hank Aaron State Trail) staff to discuss more coordinated and consistent trail maintenance, but in the meantime, city crews will continue to clear snow from the segments of the Hank Aaron State Trail from 6th and Canal to Selig Drive, as they did last year. This is how well the Hank Aaron Trail was plowed last year, the first year DPW helped clear snow west of their bridges at 32nd Street. It made the trail passable, but mountain bike tires and studs are advisable since it was not salted. This is a pretty big victory, as the Bike Fed has been advocating for this for several years. It is great that the bicycle friendly leadership at DPW has figured out a way to begin an official winter trail maintenance program. This should help with our BFC application as well, but we will have to bump up the trail priority if we are going to go for gold! Do you know where I could find some renderings or plans for the Beerline extension? Would really be great if it could continue all the way to Teutonia and Hampton. – buy a fancy bike to keep up the standard? – stuff myself into spandex and look like a sausage? – or (worse) become schvelt? – give up sidewalk riding? – carry a water bottle? – keep off of the bike paths to stay out of the way of the velodrome set? As a resident of the south side we have some great options for traveling north/south, but no good east/west route. Has a bike path in the WE Energies right-of-way between Howard and Coldspring/Bolivar ever been proposed? One continuous trail all the way from the lakefront Oak Leaf in St Francis to the Root River Oak Leaf in Greenfield would link up a ton of neighborhoods and large parks. The land is basically sitting unused, and since most of the smaller north/south streets cut off at the right of way you really only have to negotiate the major thoroughfares. Waukesha county did something very similar with the Lake Country Trail. Casey – the Beerline Trail extension will only go as far as the north side of Capitol Drive starting next summer (Keefe/Richards to the north side of Capitol). This is the Milwaukee City limit; north of Capitol is the City of Glendale so it is outside the City of Milwaukee’s hands to extend the trail north of Capitol. If you are interested in seeing plans or a rendering of the planned extension, email us at bicycling@milwaukee.gov. Dan – City of Milwaukee staff has written several grant applications, including two in partnership with the City of Greenfield, to try and get design funds and possibly some early construction going on a trail along the WE Energies power line corridor that runs through Milwaukee’s Garden District and west into Greenfield (and even east to S. Lake Drive in St. Francis). Unfortunately, it just hasn’t been awarded any grants yet.